City of Tucson leaders are demonstrating renewed commitment to supporting and fostering a positive business climate in the region. Initiatives eliminate barriers and incentivize economic development, with many triggered by job creation. The municipal investment and focus on economic development is well organized, and the private sector has responded positively. The housing market shows signs of continued stabilization, with positive downward trends in foreclosure notices and trustee’s sales. 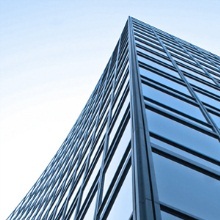 Healthcare reform has not cut into demand for space, as medical-related practices remained the most active office space users in the third quarter. Broader market activity remained relatively weak, but activity saw a slight uptick, particularly in requirements of 10,000 square feet (sf) and larger. With ongoing competition for those tenants active in the market, landlords were still aggressively jockeying to fill vacancies. Scarcity of capital on the tenant side left building owners funding improvements, moving costs and other concessions. Marketwide vacancy increased to 12.5% Q3 2012, with negative absorption occurring in class B and C space and the lion’s share of availabilities in the midtown submarket. Direct asking rates ticked down another 1.4% this quarter to $18.31 per square foot (psf), with class A rates steady at an average of $22.88 psf. 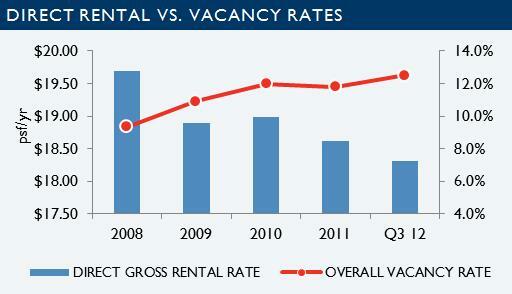 Quality space could be leased at rates in the high teens per sf. Three significant distressed buys occurred this quarter. Two by users included a non-profit purchase of Corporate Center Broadway and the County’s purchase of 160 N. Stone, with an investor buying Southwest Professional Plaza at auction. With replacement costs at three to four times current sales, the market remains soft. With scarcity of larger class A floor plates outside of downtown and the Broadway corridor, expect demand for north/Foothills space to be a catalyst for new construction in one of the projects with second phases already designed. Optimism downtown remains a bright spot, with planned construction of office at 1 East Broadway and hotel sites likely capitalizing on new financial incentives available in specified districts. Imagine Greater Tucson (IGT), the inclusive, regional visioning project, completed and announced its vision, which incorporates elements of New Urbanism. IGT will begin work on a regional transportation plan and now hopes municipalities will incorporate their work into regional plans going forward. For more information on the Tucson office market, please contact PICOR Principals Rick Kleiner, Tom Knox, or Tom Nieman or visit our website to search properties and learn more about PICOR's office and medical office services.